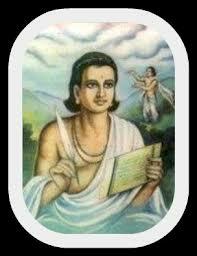 Grate and Faimaus Sanskrit Poet Kalidas Jayanti is Celebrated in November Month 2012. Kaalidaas India's greatest Sanskrit poet and dramatist. In spite of the celebrity of his name, the time when he flourished always has been an unsettled question, although most scholars nowadays favor the middle of the 4th and early 5th centuries A.D., during the reigns of Chandragupta II Vikramaaditya and his successor Kumaaragupta. Undetermined also is the place of Kaalidaasa's principal literary activity, as the frequent and minute geographic allusions in his works suggest that he traveled extensively. Numerous works have been attributed to his authorship. Most of them, however, are either by lesser poets bearing the same name or by others of some intrinsic worth, whose works simply chanced to be associated with Kaalidaasa's name their own names having long before ceased to be remembered. Only seven are generally considered genuine. Many tell tales are there for his life. Some call him native of Kashmir, some of Vidarbh, some of Bengal and others of Ujjain. It is said that he was a dumb fool to start with. The king's daughter was a very learned lady (equality of women ! :-) ) and said that she will marry him who will defeat her in `shaastraartha' (debate on the scriptures). Anyone who gets defeated will be black faced, head shaven and kicked out of country on a donkey. (The punishment part might be later aditions!) SO, the pundits took Kalidasa (whom they apparently saw cutting the tree branch on which he was sitting) for debate. They said that he (Kalidasa) only does mute debates. The princess showed him one finger saying `shakti is one'. He thot she will poke his one eye, so he showed her two fingers. She accepted it as valid answer, since `shakti' is manifest in duality (shiv-shakti, nar-naaree etc etc). She showed her the palm with fingers extended like in a slap. He showed her the fist. She accepted it as answer to her question. She said `five elements' and he said `make the body' (earth, water, fire, air, and void). [ The debate explanations are also apparently later additions] So they get married and she finds he is a dumbo. So she kicks him out of the house. He straightaway went to Kali's temple and cut his tongue at her feet. Kali was appeased with him and granted him profound wisdom. When he returned to his house, his wife (the learned) asked, ``asti kashchit vaag-visheshaH'' (asti = is; kashchit = when, as in questioning; vaag = speech, visheshaH = expert; i.e. are you now an expert in speaking''). Another story says that he was the friend of Kumardas of Ceylon. He was killed by a courtesan once when he visited his friend in Ceylon. mainly his epics - Raghuvansha and Kumaar-sambhavam; `khanDakaavyaa' - Meghadoot; and dramas - abhigyaan-shaakuntalam, Vikrama-uravasheeya, and Malavikaa-agnimitra are considered his works for sure. Apart from that `Ritu-sanhaar and Shruta-bodh are considered his works as well. 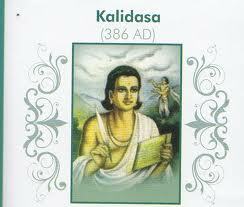 Kalidasa was expert at both. Meghadoot is immersed in the 'vipralambha-shringaar'. Kumara-sambhavam's 8th chapter is epitome of `sambhoga-shringaar'. 4th chapter of KumarS (Rati-vilaapa) and 8th chapter of Raghu-vansha (aja-vilaapa) are superb examples of `karuN.-rasa' (pathos). Kalidasa's comedy is of the highest order. (Bharata in his NaTya-shaastra mentions 8 types of comedy from the crudest of physical comedy resulting in guffawing loud laughter to the most subtle where the heart smiles). Kalidasa's comdey brings a gentle smile, not a loud guffaw. Kalidasa uses artha-alankaar more than the former. He is famous for his 'upamaa' (metaphor?). Indian pundits say, upamaa kaalidaasasya'' (upamaa like Kalidasa's). His upamaa are clear, complete and beautiful. His observation is sharp and subtle. He knows the nature and human nature in and out. He has a sound knowledge of the scriptures. His `utprekshaa' (simile) and `artha-antaranyaas' (transfer of meaning) are also very beautiful. He has used some `shabda-alankaar's as well. `anupraasa' (alliteration), `yamaka' (same word repeated with different meaning), and `shlesha' (pun; one word two meanings). Kalidasa loves the softer side of nature. He mentions serene and beautiful ashramas, river banks, gardens, palaces, bumblebee, deer, cuckoo etc. He loves Himalayas more than the Vindhyaachal (both mountain chains). valeeshu tasyaaH skhalitaaH prapedire chire.N naabhim prathama-oda-bindavah. 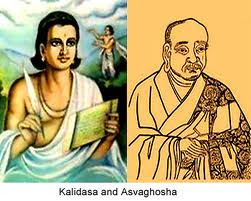 In addition to these three plays Kaalidaasa wrote two long epic poems, the Kumaarasambhava ( Birth of Kumaara) and the Raghuvamsha ( Dynasty of Raghu). The former is concerned with the events that lead to the marriage of the god Shiva and Paarvatii, daughter of the Himaalaya. This union was desired by the gods for the production of a son, Kumaara, god of war, who would help them defeat the demon Taaraka. The gods induce Kaama, god of love, to discharge an amatory arrow at Siva who is engrossed in meditation. Angered by this interruption of his austerities, he burns Kaama to ashes with a glance of his third eye. But love for Paarvatii has been aroused, and it culminates in their marriage. The Raghuvamsha treats of the family to which the great hero Rama belonged, commencing with its earliest antecedents and encapsulating the principal events told in the RaamaayaNa of Vaalmikii. But like the Kumaarasambhava, the last nine cantos of which are clearly the addition of another poet, the Raghuvamsha ends rather abruptly, suggesting either that it was left unfinished by the poet or that its final portion was lost early. Finally there are two lyric poems, the Meghaduuta ( Cloud Messenger) and the Ritusamhaara ( Description of the Seasons). The latter, if at all a genuine work of Kaalidaasa, must surely be regarded as a youthful composition, as it is distinguished by rather exaggerated and overly exuberant depictions of nature, such as are not elsewhere typical of the poet. It is of tangential interest, however, that the Ritusamhaara, published in Bengal in 1792, was the first book to be printed in Sanskrit. On the other hand, the Meghaduuta, until the 1960's hardly known outside India, is in many ways the finest and most perfect of all Kaalidaasa's works and certainly one of the masterpiece of world literature. A short poem of 111 stanzas, it is founded at once upon the barest and yet most original of plots. For some unexplained dereliction of duty, a Yaksha, or attendant of Kubera, god of wealth, has been sent by his lord into yearlong exile in the mountains of central India, far away from his beloved wife on Mount Kailasa in the Himaalaya. At the opening of the poem, particularly distraught and hapless at the onset of the rains when the sky is dark and gloomy with clouds, the yaksa opens his heart to a cloud hugging close the mountain top. He requests it mere aggregation of smoke, lightning, water, and wind that it is, to convey a message of consolation to his beloved while on its northward course. The Yaksha then describes the many captivating sights that are in store for the cloud on its way to the fabulous city of Alakaa, where his wife languishes amid her memories of him. Throughout the Meghaduuta, as perhaps nowhere else So plentifully in Kaalidaasa's works, are an unvarying? freshness of inspiration and charm, delight imagerry and fancy, profound insight into the emotions, and a oneness with the phenomena of nature. Moreover, the fluidity and beauty of the language are probably unmatched in Sanskrit literature, a feature all the more remarkable for its inevitable loss in translation.